Like all Club Residences, Broadway One Bedroom units feature a full kitchen and have an average size of 600 sq. ft. (56m2). Your bedroom is appointed with crisp European linens, an enveloping down duvet and a pillow top mattress for a sense of deep comfort. Between visits, Owners may store clothing and other personal items in a personal wardrobe locker which is placed in their Residence prior to the Owner’s arrival. To schedule an appointment or to receive an Ownership Portfolio, please contact Ed Schnatterly at 877.644.8900 or email: eschnatterly@phillipsclub.com. 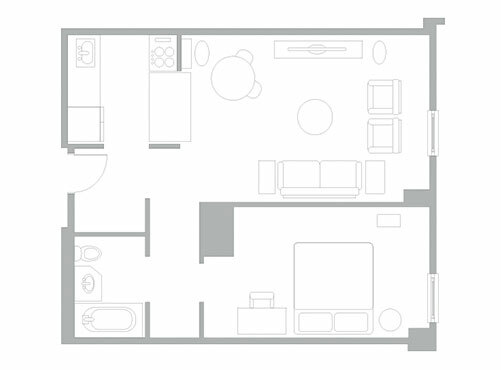 Typical floorplan shown, floorplans may vary. For more information about The Phillips Club, please call 212.835.8800 or complete this form and our team will contact you. For more information about The Phillips Club, please call 212.835.8800 or complete this form and our team will contact you promptly about your reservation request. For more information about The Phillips Club, please call 212.835.8822 or complete this form and our team will contact you promptly about your reservation request. Complete this form to download our short stay brochure. Complete this form to download our extended stay brochure. Complete this form to download our fractional ownership brochure. Please complete this form and our sales team will contact you to schedule an appointment. To learn more about fractional ownership call 877.644.8900. Complete this form to signup for our newsletter.